Let’s take an example here. consider I am working on Account Sync and I am bringing customers master data from ERP to Salesforce.com. So to create external id in Account object, login to Salesforce.com and then navigate to setup -> App Setup -> Customize -> Account -> Fields. To create a new fields, click on new button on this page. Select the data type (for example Text) and click to Next. Provide name for this external id field (appending ext_id in the name is considered best practice) and select external id check box on this page as shown in the below diagram. Save it. external id is created and ready to use. Create the Salesforce connection and the other connection required to connect to other system like ERP. Now on Integration canvas of ICS drag and drop the Salesforce adapter on target side and complete the wizard after selecting Account object and Upsert operation. Drag and drop other adapter on the source side and complete the wizard as per scenario. (In this case it should capture the customer events from ERP). Now click on the mapping and complete the mapping. one important caution that should be taken is to map the primary key of ERP to external id of Salesforce.com Account object. I recommend to map primary id of other system (ERP) because it satisfy the requirements (unique for every different records and same for same record) of external id. but it is not mandated by ICS or Salesforce adapter. You may map external id with any field (or concatenation of multiple fields) by which you can meet the requirements of uniqueness. Once mapping is done, save and activate the flow and run it. it should work as expected. Posted in ICS, Integration, Oracle.Tagged ICS, Integration, Integration Cloud Service, Oracle, Oracle Cloud adapter for Salesforce.com, Oracle Cloud Integration, Salesforce, Upsert. Could you please tell what are filed need to mapp for upsert operation. 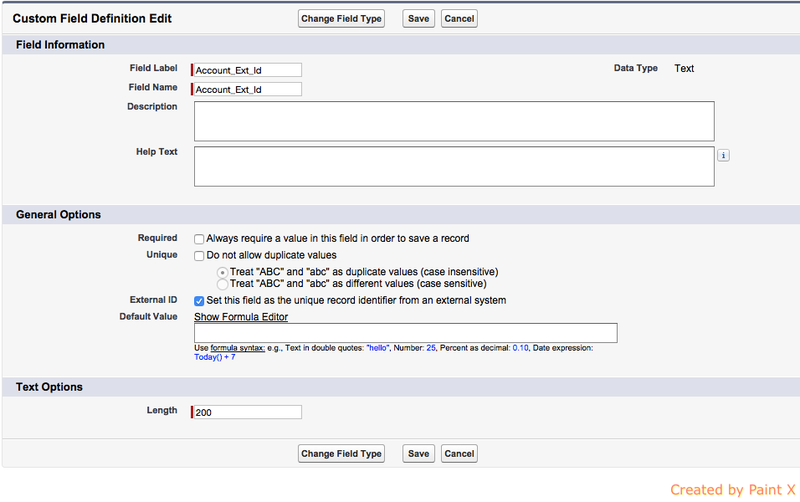 Apart adding external ID in salesforce custom field will it will display is mapping??. Yes, Once you create custom field in Salesforce.com as external id and import updated Enterprise WSDL on the connection page, you should be able to see new field in all new flows mapper. to see newly created external id field in the existing flows, you need to use regeneration option. You should map external field name and then value to the external id element. other than these you need to map as per the requirement or at least mandatory fields.